Hey, Los Angeles! It's story time. Everybody's getting together for another edition of Disoriented Comedy's Family Reunion, monthly live storytelling show co-presented by Angry Asian Man, Tuesday Night Project, Mishthi Music and KAYA Press, featuring regular everyday folks talking story. No notes. This month's theme is "Just Say It." The evening's lineup of storytellers includes Ellington Wells, Alison De La Cruz, Akemi Look, Venk Modur, Chanelle Wang, Jenny Yang, Atsuko Okatsuka and Joe Starr. 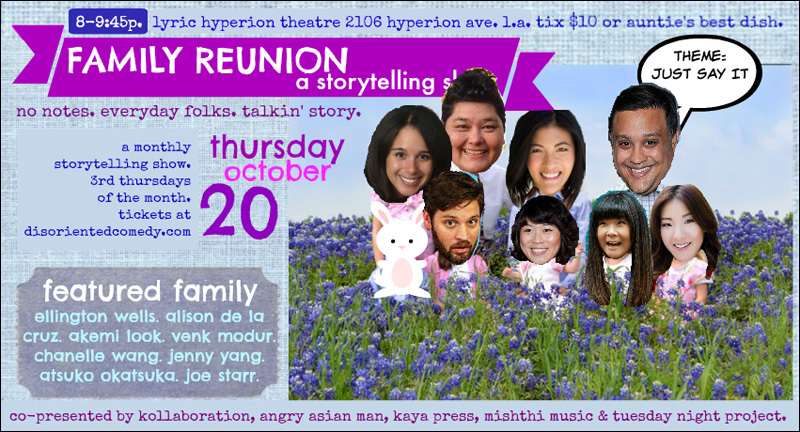 FAMILY REUNION STORYTELLING IS BACK! Thursday, October 20th 8PM at The Lyric Hyperion Theatre and Cafe in Silverlake, Los Angeles! Every month we talk story with sparkling performers and everyday folks from our communities! This series is co-presented by Kollaboration, Angry Asian Man, Tuesday Night Project, Mishthi Music and KAYA Press. * ELLINGTON WELLS. comedian. mercurial word stringer. * ALISON DE LA CRUZ. poet. performer. jaccc programmer. * AKEMI LOOK. actor. slaysian. * VENK MODUR. teacher. comedian. mirth-maker. * CHANELLE WANG. dancer. actor. pure delight. * JENNY YANG. comedian. host. opinion-haver. * ATSUKO OKATSUKA. host. comedy central asia. dancehall teacher. * JOE STARR. comedian. professional geek. * LYDIA ROBINSON. hilarious human. Always a good time. So make some plans, grab some friends and head over to Family Reunion to get your story on. For further information, check the Facebook event, and to purchase tickets, go here.